Sweetened, pasteurised skimmed milk and double cream sauce enhanced with Jersey** double cream and COURVOISIER® VS Cognac. 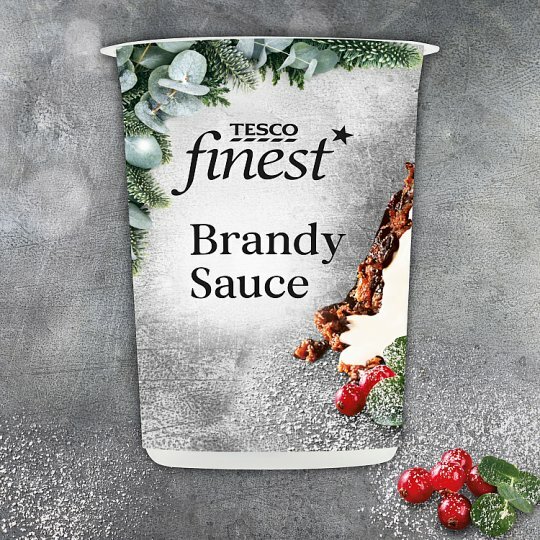 The perfect brandy sauce to serve with Christmas pudding. INGREDIENTS: Skimmed Milk, Double Cream (Milk) (30%), Jersey Double Cream (Milk) (9%), Sugar, Courvoisier ® VS Cognac (7%), Modified Maize Starch. Instructions: 800W 3 1/2 mins 900W 3 mins 20 seconds. Empty contents into a microwaveable container. Heat on full power for 2 minutes (800W/900W). Stir well then heat on full power for a further 1 minute 30 seconds (800W) / 1 minute 20 seconds (900W). Heat gently for 4-5 minutes, stirring constantly.